Southampton, PA — AdvantaPure announces the ability to deliver its single use/disposable manifold assemblies to customers with a certificate of sterility assurance to the level of 106. 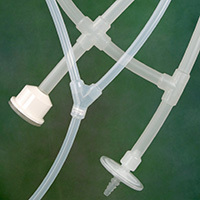 The tubing assemblies, which consist of molded manifolds and accessories such as filters and connectors, are used for batch filling and sampling in the manufacture and processing of vaccines and other pharmaceuticals. Validated sterility is achieved through gamma irradiation. "Pharma and biotech manufacturers want to receive a validated sterile part that's ready to install," says John Stover, AdvantaPure's Director of Product Management. "They don't want to go through the time-consuming process of receiving in a part, sending it out for gamma irradiation, and waiting for its return. They also don't want to maintain two inventories – irradiated and non-irradiated. Customers need to be able to open a package, attach a part, and go." Offering superior material penetration, gamma irradiation is chemical free, residual free and post-process radiation free. The irradiation process destroys microorganisms and bacteria and does not require a quarantine period like some other sterilization methods. Products are ready for shipment and use immediately after sterilization. AdvantaPure's single use systems are manufactured from platinum-cured silicone or AdvantaFlex® biopharmaceutical grade TPE in class 7, ISO-certified clean rooms. Combining tubing with proprietary molding techniques, complex and multi-legged manifolds can be produced. Connectors, filters, bags, and other components can be attached to form a complete system. The finished products are bagged, boxed, and shipped to a gamma irradiation services company, then returned to AdvantaPure and inspected before being shipped to the customer. Third-party testing was performed to determine the proper radiation dosage. Product samples are tested on a regular basis to ensure and maintain a sterility assurance level of 106. For more information on AdvantaPure's validated sterility for single use manifold assemblies, contact the AdvantaPure team at 145 James Way, Southampton, PA 18966; phone 888-755-4370 or 215-526-2151; fax 888-258-4293 or 215-526-2167; e-mail: sales@advantapure.com.